Card craps is identical to the original game, except that the dice rolls are replaced by two cards dealts from a 5-deck constant shuffling machine (CSM). As most experienced gamblers notice immediately, the odds are a little different because of the shoe. As soon as two cards are dealt from the shoe, the distribution for the next roll changes. This can’t be helped, even if the dealer shuffles the muck into the CSM after every roll. Analysis shows that the average 3-4 rolls buffered in the chute of the CSM actually tilts the game in favor of the don’t pass / don’t come player. Even without counting, the 10x odds don’t pass player has a small edge over the house (about +0.9% of the don’t pass bet). A simple card-counting strategy allows the player to vary the don’t pass (or pass) odds per roll, improving the return to about 1.8% of the flat DC bet. This means for a $5 Don’t Pass bet, you’ll make an average of $.09 per game, laying 10x odds when the count is positive. While this is not a lot of money, it’s a lot of fun, and a card-counter’s dream. You can easily count using a simple 3 roll window! The edge for the odds bet itself reaches +0.5% very frequently. It’s very easy and fun to implement advantage play in this game, which is indistinguishable from normal play (changing odds bets on the fly). This is a winning game for the don’t pass player playing full odds, no thinking required. A smart player can take advantage of the count of the shoe, and lay odds only when the count is good. This game punishes the players playing full pass odds. While a pass line bet is a normal 1.4% house edge, taking 10x odds increases the house edge to 3.9%. Do not play pass line odds without counting. If you only take 10x odds when the count is good, you can reduce the house edge down to 0.8%. It’s not a bad idea to play the pass line this way, you’ll just find that there aren’t a lot of opportunities to take odds. The best pass-line points are 5/9, and occasionally the 4/6/8/10 counts will get good (these points are biased against you; you need some good cards to take odds). Thus, your variance is reduced in this game compared to real craps, because you only take odds when you’re +EV (on average) with the count. Besides trying to grind away at the don’t pass with 10x odds (which is a lot of risk for very little), the beauty of this game is that a simple count greatly improves your ability to predict the next roll. Of course by “greatly”, I mean that its statistically significant, and at times even looks prophetic. But overall, you cannot overcome the vig of the place bets. (At times the lay against the 4/10 is profitable, since you can lay $51 to win $24 at Viejas.) Still, people like placing bets, and don’t care about the vig. If this is you, then you should play this game, and watch the cards towards predicting the next roll. For example, a (2,2) (1,2) (1,1) roll sequence will make the 9 easier to hit (1.43:1 instead of the normal 1.5:1), the 10 easier to hit (1.92:1 instead of 2:1), and the 8 easier to hit (1.18:1 instead of 1.2:1). Conversely, you shouldn’t place bets on the 4/5/6 at this time, since they got much harder to hit (2.11:1, 1.54:1, 1.22:1 respectively). I’ve heard about craps players that devote their lives towards attaining some control over the dice with their throwing technique. God knows how real this effect is, or how much time people put into attempting it. All I know is that a spreadsheet and a computer program will show anyone how cards from recent rolls affect the distribution of the next roll, often significantly. I’ll explain the details of how it all works below. The reason the game is predictable is because the distribution of the next 2-card “roll” out of the CSM is not the standard, symmetrical 2 dice roll distribution normally associated with craps. Instead, the distribution gets skewed to one side (4/5/6) or another (8/9/10), depending on the recent cards out of the CSM. This is easiest seen by considering a simple shoe instead of a CSM, where we can precisely compute the distribution of the next “roll” from the previously dealt cards. A simple spreadsheet easily makes this calculation for us. If you download the spreadsheet and play around with the rolls, you can quantify the effect of various dealt cards on the distribution. You’ll see that a “low” roll (both cards <= 3) have a +0.25% (quarter percent) effect on the 4/10 odds EV. Similarly, you'll see that "snake-eyes" (1,1) has an equal effect on the 8 point, as does (2,2) affect the 9 point. 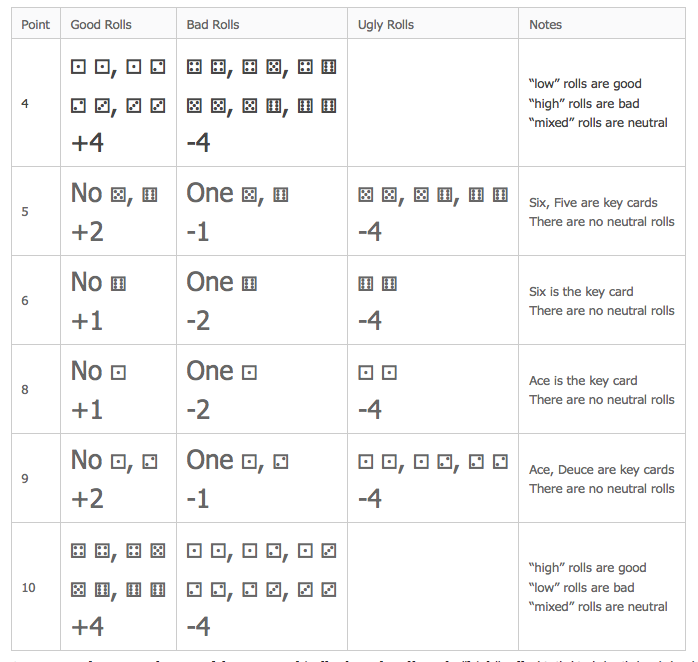 These sensitivities are summarized in the table below, showing "good", "bad", and "ugly" rolls for a given point. Here, a +4 count equals a +0.25% edge on your Don’t Pass odds. As an example, we use the spreadsheet to graphically show the effect of 5 "high" rolls (6,6) (6,5) (5,6) (4,4) (5,4) out of a new shoe. We enter these cards into the spreadsheet, and plot the distribution of the next roll out of the shoe. The distribution is visibly skewed, favoring the low side points (4/5/6) since we’ve just used up a bunch of cards that can be used to form 7 and (8/9/10). At this point, any “don’t” odds for 8/9/10 and any “do” odds for 4/5/6 are +EV. This graph clearly shows the effects of previously dealt cards on the distribution. Next, we’ll examine the effect of the CSM on this process. If the game were dealt out of a simple shoe, then our count would give us a perfect view on the distribution of the next “roll”. However, it’d be difficult to track the separate counts for each point. The 4/10 points would be easy to track, but you’d need a separate person to track the other 4 points (5, 6, 8, 9). Ideally, you’d know the exact odds for each bet with perfect tracking (e.g., a spreadsheet). The use of a CSM to deal the cards actually makes counting easier. Often, the casino employees will tell you that the CSM makes the rolls random, so it’s a fair game. That would be true if the cards that comprise the most recent roll had an equal chance of coming out of the CSM on the next roll. Of course, this isn’t the case, because of the buffer of cards in the chute of the CSM. This buffer, or reservoir, is needed so the dealer can always quickly deal another card out of the CSM without waiting for the shuffle mechanism to spit out another card. This reservoir is kept at some minimum depth, so the chute never “goes dry”. So, you can intuitively see how a quick run of favorable rolls can affect the odds of hitting a point. To get an accurate analysis of this effect, you need to model the shuffler, insert it into a game, then find the correlations. The game at Viejas is dealt out of a CSM, which holds 312 cards (52 sets of “dice”). They use a ShuffleMaster 126 CSM, which I’ve modeled with 40 slots in the shuffling window, and where the muck is shuffled into a random position of a random slot. I set the minimum reservoir depth to 10 cards, and when the reservoir is lower than this threshold, the shuffler drops an entire slot into the chute. I did not place any limitations on the number of cards in a slot. You can see my source code for the shuffler for complete details on how its modeled. Analysis shows that a simple windowed count with the above roll count values yields an amazing linear correlation to the (dis)advantage on the point. The graph below shows the correlation between a six roll windowed count and the odds EV/roll for each point. The correlation shows almost perfectly straight and parallel lines for each point. These results match the spreadsheet results for a full shoe. A windowed count is different from a running count, in that you only add up the roll values for the last N-rolls out of the CSM. I’ve analyzed various window depths, and the performance is almost equal for 3,4,5, and 6 roll windows. (Of course, the more rolls you can remember, the more accurate your count is. However, as the window widens, the correlation decreases slightly.) Personally, I find it very easy to use a 6-roll window for the 4/10 and 6/8, but I’m lucky if I can remember the last 4 rolls for the 5/9 count. Per-Roll Odds Bet EV vs. 6-roll windowed count. Advantage of Pass/Don't Pass Odds Bet for each point, depending on count. The meaning of “odds bet advantage” in the above graph is the EV of the bet excluding non-event rolls (not 7 or point). So when you have a +12 count against a 4 point, you’d make an average 2.5% profit of the entire lay, when you tally up your net results over the long run. This graph shows that on average, we’re +EV for laying odds against the 4/6/8/10 points when the count is >= 0. The 5/9 points are “fair”, in that it’s odds are the same for a regular craps game when the count is neutral. These are the same biases that we saw in the spreadsheet. I’ve blogged about various counting strategies (see my card craps posts), but I’ll summarize the basics of practical counting here. It’s especially easy to count the 4 and 10 points, because these counts are multiplicative inverses (x -1) of each other. I also call this the hi/lo count, since it reflects the net of high (both die >= 4) and low (both die <= 3) rolls in the window. For example, if the hi/lo count is 0 (neutral), then it's to your advantage to lay DP odds against both the 4 and 10 points. Furthermore, if the hi/lo count is neutral on the come out, and the point comes out 4, then you're at a +4 count against the 4, which yields almost a 1.5% advantage for your DP odds. If a high roll (e.g., `Yo) comes out next, this brings the windowed count back to 0, but you still have a 0.5% advantage for your DP odds. If a high roll comes out again within the window, then the count is -4, and you should not lay DP odds against the 4. On the other hand, you'd have almost a 0.5% advantage taking odds on the 4 point. I think it’s reasonably easy to maintain a 6-roll window count on the 6/8 points. Usually, I’m playing with another counter, so we can ask each other if they remember the key cards (Ace for the 8 point, and 6-spots for the 6 point). In general, its okay to lay against the 6 or 8 if there’s 2 or less key cards in the 6 roll window. Notice that 2 key cards in the window corresponds to a neutral (0) count, but the game is biased against the 6 and 8, so you still have a 1/4% advantage for your DP odds here. At 3 key cards in the window, the count goes to -3, and you should not lay DP odds. Note that two good (+1) rolls neutralize a bad (-2) roll. Note that it takes 5 good rolls in the window to neutralize an ugly (-5) roll. That doesn’t mean you have to wait for 5 good rolls following boxcars to lay odds against the 6 point. But it does mean that the window needs to contain 5 good rolls to neutralize it. So, if the boxcars came after 5 good rolls, it’s still okay to lay against the 6. You should work out other examples with pencil and paper to see how you’ll count in real life. Here’s my easy way of knowing whether I should lay the 5/9 points. On the come out, I think back if there was an ugly (-4) roll in the last two rolls. This is pretty easy, because those horn rolls and hard-4/10 stick in your head. If there wasn’t an ugly roll, then the worst you can be is at a neutral count (the come out is +2, and two prior bad (-1) rolls) in a 3-rolll window. So I initially lay against the 5/9 unless I remember an ugly roll in the prior two rolls. Then, I apply a running count for each subsequent roll. So, I’m as accurate as my initial count. Very often, the roll sequence makes your decisions obvious, and the count becomes very easy to track after the point. Ok, now that we know how the roll distribution is biased given our 3, 4, or 5 count window, what’s the best way to play the game? Well, as I’ve said, the only +EV way to do this is to play Don’t Pass, and change the Odds you lay against the point, based on the count. This is called “Variable Don’t Pass”, and is described below. Another way that is +EV is to sit around and wait for good counts against the 4/10, then lay $51 to win $24 (or various multiples of this amount up to $2000). This is actually +EV, but not by much, since the vig is fairly expensive. In this strategy, you place a Don’t Pass bet, and lay odds when the count is good. Keep track of the count for the given point. If the count goes bad, pick up your odds. Ideally, you may change your odds bet on a roll-by-roll basis. Its pretty easy to track the count for a given point, since you focus on the “key” cards (e.g., the Ace is the key card for the 8 point; the Six is the key card for the 6 point; Aces and Deuces are the key cards for the 9 point; Sixes and Fives are the key cards for the 5 point; high and low rolls are important for the 4/10 points). It gets pretty mechanical once you have some practice. To get +EV results, you need to max out to 10x odds for any positive (> 0) count against the 5/9 points, and for any non-negative (>= 0) count against the 4/6/8/10 points. It’s a lot of variance, so you can trade off EV for peace of mind by laying smaller odds. Personally, I increase my odds lay by 1 unit for each +4 count (+0.25%). I lay a max of 4x odds against the 4/10, and 2x odds against the 5/6/8/9 points. I can’t beat the 1.4% house edge on the flat bet with these small odds. Changing your don’t pass odds in the middle of the roll is very typical, even in a regular craps game. So, this type of behaviour is not ruled out as card-counting. I’ve been doing it on every roll, and no one cares. You can also get +EV results by waiting around for the count to get good against the 4 and 10 points. Any time there’s a +12 count (e.g., three “low” rolls and 2 neutral rolls out of 5), you’re +EV to lay $51 to win $24 against the 4/10 points. This comes up frequently enough, but may not last long before the count goes bad again, either by a bad roll occurring, or when the good rolls fall out of the window. Typically, when I do it, I’ll allow the count to go down to +4 or +8 before I take down the lay. The good thing about this is that you get your vig back when you take the bet down. Yay! There’s a guy at Viejas who just lays against the 4/10, but he doesn’t count cards. He just puts up the bets until they’re resolved, win or lose. Plus, he bets $500 at a shot, or more. A fun, but very -EV way to employ the count is to make short-term place bets based on the count, on the most heavily-affected number. It’s fun, because fairly often, you’re right with the predictions. It’s expensive, because the vig on place bets is so -EV, no count in the world will make it good. In the PlayCraps format, it’s really easy to change your bets on-the-fly, because you’re very close to the dealer, and its almost like playing a board game together. You could not take your bets up and down like this in a standard craps tub format. For example, say all of a sudden I see a (1,1) roll, followed by (2,2), then (1,2). These are all good rolls for the 9 point, and the count is +12. The odds against the 9 are down from 1.5:1 to 1.43:1. It’s still -0.4% to place the 9, but I’m really likely to make the bet anyways. I’ll let it go a few rolls, then take it down if it doesn’t hit or lose to the 7. I’m also likely to place the 6/8 if I see a good roll sequence. For example, (1,1) and (1,2) and (1,1) bring the odds against the 8 down from 1.2:1 to 1.16:1. The EV on the place bet is down to -0.08%. Its worth it to bet, just for the satisfaction of being Nostradamus. If you call enough numbers, and openly count, the other players look at you, then look at the CSM. I’ve run simulations for all types of counting systems, with various parameters for the maximum muck depth (cards the dealers collect before feeding the CSM) and CSM buffer depth. All results agree with what a basic spreadsheet will show you. For every good roll against a 4/10 point, you pick up +.25% advantage on your odds. For every good roll against a 5/9 point, you pick up .13% advantage (half as good as the 4/10 point) on your odds. And for every good roll against a 6/8, you pick up 0.055% advantage (1/4 as good as the 4/10 point) on your odds. The CSM is your friend. It makes counting easier, since you only have to remember the texture of the last 6 rolls. If the dealer allows muck to collect before feeding the CSM, widen your window to include the muck cards. When the dealer feeds the CSM after every roll, just keep track of the texture of the last 3-6 rolls. The floor personnel are not worried about counters in a CSM game, because they’re told you can’t count against it. However, with “dice”, each roll changes the distribution of the next roll, so the effect is much greater than in blackjack. It’s the same any way you cut it. The game is biased against the pass line, and favors the Don’t Pass. While the edge is small, it plays very well, since counting is very easy, and your advantage can increase dramatically in a few rolls. Furthermore, the game is perfect for betting when the count is good, since you can lay up to 10x odds on your Don’t Pass bet when the count is good. And, you can immediately take down your odds if the count goes bad. It’s a counter’s dream. All my posts on card craps. Card Craps Counting with Pen & Paper Right at the Table! Spreadsheet for roll distribution, showing effect of dealt cards. Back when Barona used to use a CSW for their craps game, I determined that a player on the don’t pass could have beaten the game if he could have taken around 11x odds. (Barona only offers 5x odds.) What I did not consider was a buffer in the CSW (e.g., my analysis was based on the possibility that either of the two cards on a certain roll could potentially show up on the very next roll). Also, I believe Barona used a pool of 312 cards, whereas Viejas uses 248. I’ll have to check it out. Viejas’ Web site is currently touting a $3 minimum at their PlayCraps table. My bankroll might be able to handle that! They only do the $3 game on some weekend nights. If you call and ask, it’s the game in the “Party Pit”. And yes, I remember for a short while seeing the CSM-based craps game at Barona. That was before I had any idea the game was beatable. I really enjoy the game, but the variance is too high for me to want to take it on. I just play $5 don’t pass (one point at a time), and vary my odds from 0x to 4x, proportionally to the count. (Actually, I wait for the count to get better than 2 before even laying 1x odds.) I expect to break even with this scheme, but it’s very low variance, and fun. In the last 8 sessions, may max win was +$230, and my max loss was -$60. What about counting and then when count is high you place bets on the 7 prop ? Might be better….. This is very interesting… but can you explain why there would be a higher distribution of 7’s inherent in a deck of cards than the normal distribution in a pair of dice? There’s only a slightly higher initial frequency of 7’s in the shoe (e.g., for 44-sets of “dice”, there’s a .38% higher 7 frequency than physical dice). What’s more important is the relative frequency of 7 vs. the point (i.e., the actual odds of the DP). This effect can be seen by example: start with a full shoe, then “roll” a hard-10 (5,5). Next, roll a yo (5,6). Thus, we’ve used up 3 Fives and a Six from the shoe. The Five and Six are much more important to making the 10-point, than they are to make a 7-out. That’s because the only way to roll a 10 is (5,5), (6,4), (4,6), while you can make a seven by (1,6), (6,1), (5,2), (2,5), (3,4), (4,3). So now, the probability of rolling a 10 is down to .08055 (it’s .08333 with real dice), while the probability of rolling a 7 is up to .16727 (it’s only .16667 with real dice). Together, the odds of hitting the 10 instead of the 7 on the next roll is 2.08:1 (instead of 2:1 with real dice). The spreadsheet will show you this, if you play around with it. The most important difference with a cards-based game than a dice game is that independence of rolls is gone, and instead you get correlation. Each roll changes the distribution of the next “roll”, until the cards have a chance to be dealt out again, which is finite, because of the nature of the buffer of the CSM. All of the effects of the CSM have been modeled and simulated, and even when the dealer minimizes the amount of muck collected before feeding the CSM hopper, the bias towards Don’t Pass remains, and counting based on a trailing 6-roll window works. Ok, even though they load the CSM with 44 sets of dice (Ace thru Six), the fact that the two “die” in a roll are not independent (like physical die), make the 7 a little more likely to come out that first roll. E.g., say the first card is a Four. Now, in physical dice, the chance that the second die is also a Four is 1/6. However, coming out of the shoe, the probability is less, only 43/(6*44-1). So, the probability of the first roll being an 8 relative to a 7 is lower than the normal 6:5 ratio. However, the 5 and 9 are normal 3:2 to the 7. Its just these little differences between a finite set of cards relative to independent die that make the game weird, and Don’t-biased. if you have a few minutes to mess around with something like this, I’d love to hear your feedback… shoot me an email… it’s a private beta, by invite only, with <100 testers for now…. Cool, will send you an email. Hey, you got linked from The Wizard of Odds site. Congratulations! IT IS A GREAT DISCOVERY. KEEP ME POSTED FOR FURTHER SYSTEMS,PLEASE. I met you before at Viejas. Unfortunately since the Wizard of Odds has covered this game, everybody and his brother will flock to San Diego to play this and this game would be pulled soon (or Don’t Pass bet would not be allowed any more). It would have been better for you to keep this secret for yourself; you would have had a meal ticket for life. Don’t worry about management shutting this game down. They’re more worried about people *not* playing the game than about any possible player edge. I count out loud, and try to convince the floor supervisors that the game is beatable. No one cares. Everyone at Viejas would be ecstatic if they got real action on the game. During the day, the dealers usually stand dead at the game. Of course, if big action came in, and beat it seriously for a month, they’d probably close it down. But that wont happen, even though I’m going to write a series of tutorial articles on how to beat the game. I’ve noticed and have been playing (and winning a little) the DP line at Viejas. The table is always nearly dead. People come in and drop $20 or so and leave. After having read the above, I think it’s time to learn a new skill (card counting). IMetyouBefore – you don’t know Steve very well when you say “you should have kept this secret for yourself…” Steve has exposed other +EV games in the past, one in particular was insanely +EV and Steve posted all the details on the net, and big money did come in and the game was shutdown. Steve is motivated by the challenge of finding these situations, not by exploiting them for personal profit. I went to play at Viejas tonight, to see if there was anyone or any action at all related to the recent traffic from the WizardOfOdds. As usual, there were only the regulars betting the way they always do. There’s one guy, a total nut, who just plays the field, using some form of a Martingale system. He just stares at the field and his checks, never looks up, and maybe mumbles something every now and then. His real system is to bet until its gone, even if he has to stack all his chips on the field to do so. It’s only me and the dealers that count and make predictions. We’re all hoping for the big action, but we don’t think it’ll happen. thanks for the info, I just got back from viejas and tried the system. I went friday night at 7pm and there was still 1 seat at the table. I was the only one counting and playing the don’t pass. Counting saved me a few heavy losses as I removed the odds when the count went bad. Ironically enough, I switched to the pass line at the end and took a lot of odds since the count was good on the 10. And I won. One quick question when you have time; If I play the pass line can I count the same way and just bet when the count is negative? Is the count -2 just as it would be if I was playing the don’t pass? Yes, you just invert the count to apply it to pass line odds. The example roll you gave is good for your 8 odds if you’re playing a 4-roll window, as the count is 2 -1 -1 +2 = 2. Personally, I play a 6-roll window, so this sequence is just neutral, and I need another 1 in the window. I went back to a 6-roll window, because of refinements to the CSM model (finite time to shuffle in muck, and revision down to 18 slots). It sounds like you have it! Have you tried my online practice game yet? It simulates a CSM shuffler like they have at Viejas (18 slots). There’s no model of the finite shuffle time, which is probably more accurate for a slower, full game. You can try some sessions with a 4-roll window, and some with a 6-roll window. Excellent analysis! I just found this page and I’m impressed with the thoroughness of the approach. I’ve long been a fan of Don’t systems in general, so I will see if any of my methods will fit into this approach. I like the flexibility in being able to adjust my lay odds based on the count. Would be interested to hear if you have written the tutorials that you mentioned above. Thanks. Very impressive analysis I must say. Quite thorough and rigorous. I am curious on what you think the player edge is per roll without counting. And what is the edge with counting say 5 roll windows? There are some differences in numbers through the posts. Keep up the good work. I just re-ran the simulations to check, and playing don’t pass with constant 10x odds (no counting) yields about 1.0% of the flat bet per game. E.g., playing $5 don’t pass with 10x odds, you’ll make an average of $.05 per game. If you use the windowed counting method to lay 10x odds when the count is good and 0x when the count is bad, you’ll double your return to about 2.0% per game. Per game means for every decision/roll (and not come out roll)? Thinking about perhaps visiting the casino. Thanks for the help. Per game means each time the don’t pass flat bet is resolved. A game may be as short as one roll (7, 11, or craps on the come out roll), or can take many rolls until the point is made or 7 out. Steven, I am big fan of your, you have great analysis on all games. I was playing Card Craps @ Barona on other night, they rolled the dice to determine two card, but they shuffled every time shooter rolling the dice, they has two set of cars from A-6( same as the dice), shuffled it and set it in the boxes with dice pictures below the boxes. Does the rolls combination same as the real dice? I concern was 6 combinations to rolled 7 on the dice every time rolling the dice, if every time those dice combination that the cards set up fall in different number other than 7? Thank you and keep up the good work. This type of games has identical odds to actual dice craps. There’s no advantage play here. Don’t come bets would have the same player advantage, right? It’ll probably be too confusing though if playing the count. The advantage on the Come odds are a little less than the Don’t Come odds, because the counts are slightly biased towards the Don’ts. In other words, the Don’t counts start off + for the 10/4 and the 6/8, and are neutral for the 5/9. So even at 10x odds, counting and varying your Come/Pass odds won’t overcome the built-in odds against the numbers. As I’ve said before, the best way to play the game is to bring pen & paper, and write down the rolls. It’s pretty easy to play DP and vary the odds with the count (i.e., look at the last 6 rolls, and check if the count is good to lay odds against the point). That’s what the practice game does. 1. In a DP Bar 12 format where the count is high in favor of a DP 4 point, the reduced probability of hitting an ace-ace / ace-deuce on the initial phase of the game may be significant enough to eliminate any material advantage of the high count on the lay phase of the game. I have not “done the math,” but there may even be a cross-over point where there is a net disadvantage. 2. In a DP Bar 12 format and if seeking to maximize profit over time, one could watch the game until the count favors a DP 10 point. Then, play the game and have 2 distinct advantages: (i) a reduced probability of hitting a 5-6 on the initial phase of the game, and (ii) the high count on taking odds on a DP 10 point (if and when the 10 point is established). I also looked into the advantage of watching the count (i.e., when the distribution favors the low points, and low craps) before the come-out roll. Yes, this would probably be a good time to increase your DP bet. Maybe I’ll look into quantifying the advantage for this condition. Thanks. Hi, thank you for this great analysis, I have always been interested in Casino +EV spots and have found some on my own in the past. This post is pretty old, did anything change in this game, does it even still exist? Yes, just it played today. I post frequently on this game with the card craps tag. On my system this page doesn’t show the key cards. The little squares are just blank. Could you explain that to me or re-post the key cards in a different format? Sorry, I use Unicode characters for the dice. Here’s a screenshot of the roll weights. I was wondering how the card craps game would be affected if the casino offered 3-4-5x odds rather than 10x? You’d barely be +EV @ only 5x odds. However, it’s still fun to adjust your bets according to the count. Anytime you’re correctly laying or taking Pass or Don’t Pass odds based on the count, you have an advantage on the odds bet. Ok. Thanks a lot for your quick reply! I have another question. If three (2,3) rolls showed up in a roll, would it be profitable to play the field as well as laying the four? I haven’t looked into counting schemes for the Field bet, but I’m guessing it’s never +EV. Typically, counting and collusion schemes work best when the house advantage is small to begin with, or the payout offers large odds. And, as I’ve posted before, three low rolls make laying the 4 slightly +EV after considering the vig. I see. Thank you once again. If you had a series of high rolls, would there be advantage betting on the hard 4, or if you like, found that there were a lot of rolls that didn’t have a 4, allowing you to bet on hard 8. We tried it out a bit and it did generate some profit, but it might be more due to luck than some type of advantage. Also, for the don’t pass, does it make sense to back it up all the way no matter what the point is, if you’re not counting, as you always have an advantage with the 7 showing up most probably? I looked into the hardway bets, and they start to get close to break-even if you haven’t seen one of the cards in a long, long time. But overall, it’s really hard to overcome that kind of house edge. Alright, thanks a lot. I mean, there’s the Don’t Pass and Lay that you can have fun with, but I’m still not entirely sure how the “Predict-A-Roll” thing works. I tried to see which parts of the board it applied to (in terms of betting the field with a series of lower numbers in a row or trying hard 4 during the same situation), but yeah, I would like more explanation on roll prediction. Just seems fun to do it on the side, but I’m not entirely sure on how the count corresponds to picking the future rolls. Your software is interesting (and useful) for seeing how the count changes, but there is a fatal flaw that makes it very misleading to those not paying attention. Isn’t it true that you would only net 9 units? You would win even money for the don’t pass line bet, and then your (true) odds pay out at 5 to 6. If you win betting against a 4 laying 10x odds you would only net 5 units should you win. At Viejas, “10x odds” means they let the player lay enough to *win* 10x the flat bet. That means against the 5/9 points, you can lay (15)(flat bet) to win 10x on your odds. So you’re risking 16 (1 DP @ even money + 15 odds @ nominal 3:2) to win 11 (1+10). On the 4/10 points, you’re risking 21 (1 DP @ even money + 20 odds @ nominal 2:1) to win 11 (1+10). On the 6/8 points, you’re risking 13 (1 DP @ even money + 12 odds @ nominal 6:5) to win 11 (1+10). The beauty of the game is that for a $5 DP bet, you can lay $100 on the 4/10 points when the count is good. Often, you’ll have a 2-3% “advantage” on this odds bet. Of course, the problem is that it probably won’t resolve on the next roll, and the count may get worse, and you may have to take down your odds bet. Usually though, the 4/10 points have good counts. The 5/9 count tends to bounce around a lot, and it’s hard to track. So you’re often laying $75 to win $50, but you’re also often picking up the odds until the count gets good again. The 6/8 points are easy to count, and are often good. You can lay $60 to win $50 on a $5 DP bet on the 6/8 point. That’s interesting. I rarely play the don’ts. Is that how all casinos handle the wrong-way odds? I met the guy who invented PlayCraps at an event in CT about four or five years back. He ran a casino event for my former employer and we had a long discussion about his brainchild. I remember thinking that card-craps would never catch on because the allure of craps is the illusion of control the shooter has. Without that, craps would blend in with every other table-game. I’ve since moved to California where dice are essentially illegal, so I suppose it makes sense here. Yeah, it’s kind of weird playing the Don’ts, even when there’s a good reason to do it. I think that’s the way all casinos handle don’t odds, but I haven’t checked it out personally. The PlayCraps format is kind of weird, and I’m one of the few people who like it. On the plus side, you get to sit down, count cards, and play very quickly. On the minus side, the game kills the players taking odds on the pass line. As the analysis shows, the pass odds are often at a 2-3% disadvantage, when they should have 0% house edge. I’m pretty sure that people can “feel” this drag on their action. The house likes the game because the hold is huge. There’s more prop bet action than normal in this game, because its featured prominently in the layout. Some people only play the Field and the Horn at Viejas. Also, it only takes one dealer to man the table (up to 4 or 5 players), which is significantly cheaper than paying for a whole crew on a craps tub (stickman, boxman, etc.). I’m working on a Flash-based game that will show the count, the cards, the layout, and will be much more fun to play. It’s my first time doing all this visual effects stuff, so it’ll take a few days, but it’ll be worth the wait. Very informative site – stumbled upon it after a weekend at the Morongo casino where I started wondering about whether their craps game was beatable. My wife and I went on one hell of a run playing pass (turned $200 into $1900 at a $10 table, 3-4-5 odds) – I knew we were lucky, but I didn’t really appreciate how lucky until I came here. It looks like your model assumes there is only one shuffler – is this correct? At Morongo there are two independent shufflers – I’ll play around with the spreadsheet for a bit and see how that affects things. I haven’t looked at the game with two independent CSMs. I’d guess there’d still be some effect of a count, but it might be less than with a single CSM. I’ll put it on the To-Do list. hey steve lori from viejas. i’ve been trying to learn to do this but i can’t seem to remember more than one or two rolls. (getting old i guess). any tricks to do it? i’m still doing good with the inside numbers but i think this may help me turn them off. next time i see you and ray i have to pay attention. Counting doesn’t help with the way you like to play inside numbers. The closest fit to your style of play would be to watch Aces and Six-Spot cards, then place the 6 or 8 when the count gets good. It’s hard to ever get +EV on a place bet, because the vig (i.e., 7:6 instead of the true 6:5) is so high. But when you see 5 or 6 Aces in the 6-roll window, the 8 place bet is close to +EV. Also, if the count is +12 or +16 on the 4/10, and you can buy a $25 bet for $1 juice (depends on who’s dealing), the bet is +EV. Overall, counting is great for the Don’t Pass odds, and sometimes for the Pass Line odds. Rarely, I’ll place the 6 or 8 when the count is good. But I don’t like turning my bets on and off through the dealer, it gets a little silly. Counting is best for the pass/don’t pass odds bet, since it’s self-service. Do you mean that a packaged “deck” of craps cards has 8*6 = 48 (8 sets of “dice”) in it? Viejas actually stuffs the ShuffleMaster one2six CSM with the maximum 312 cards when they open the game everyday at noon. The one2six means it can accept one to six decks of 52 cards, so 6*52 = 312 is the maximum number of cards that it can take. I’ve seen them do it, and remember it was somewhat difficult getting all the cards in there. So, they open 7 packages of cards, and use 6.5 packages = 312 cards to fill the machine. BTW, when I saw them doing this, they were re-using old decks (they didn’t break new packages open). At any rate, all the analysis in my posts refers to the ShuffleMaster one2six using 312 dice cards. Hi Stephen – I had a question on if the material here is still applicable at places like Pechanga now where they deal out 12 cards per roll (6 blue 6 red), and reveal the top of each card as the resolved roll. They then put the 12 cards back in the CSM (two-step motion, 6 blue first, then 6 red). Is this the same as how you’ve seen it when you wrote this? Or is this the casinos updating their process? Wouldn’t this effectively get you to be only able to do a 2-windowed count? I’ll have to look at the details of Pechanga craps, but as I remember, it’s no longer countable. Even if they dealt directly out of a CSM or even a shoe, you still need 10x odds like Viejas to have an edge on the game. Just wanted to let you know that Viejas finally got rid of their card craps and added a real craps table. It opened Aug 30, 2013. Of course it’s “California Craps” using cards and dice just like Barona and Sycuan. The cards are shuffled after the shooter craps out. Barona just recently changed their rules and now shuffle the cards after every roll of the dice. Yes, I hear lots of players whining about how they shuffle the cards after each roll at Barona, as if it changes the odds or math in any way. Too funny. I’ve also asked the dealers why the change was made, and none of them knew, or if they did, would not say. I can’t imagine any good reason, really. so no more sitting at viejas. that was the only reason i went so i didn’t have to stand. as far as barona changing the cards after each roll i think it makes a big difference. a shooter tends to throw the same numbers when you change the cards after each roll it is hard to get a good run. we did have two nice rolls but only one point for the two. i still look at what a natural 7 will give me if it doesn’t have at least two inside numbers i turn my bets off. One note on Viejas – they still offer 10x odds. Table limit is relatively low compared to Sycuan and Barona at $5 to $600. It’s a lot busier than the Play Craps table usually was. I’ve even seen some Barona regulars at Viejas now. They designed the table so it can be run with just two dealers instead of three. If there are only two then the stick person does the cards – the table layout has a duplicate set of boxes for the cards in front of the stick as well as in front of the box. I hope some day they get rid of the requirement to have cards. It’s one of those silly rules that doesn’t provide any benefit to anyone – not to the casino, not to the state, and not to the player. At best it provides some benefit to Las Vegas! Totally agree about the silly requirement about cards. Would love to see that change, too. I agree that it’s really dark and can be very hard to see the dice. The dealers I talked to asked me to complain about it – the dealers have complained but nothing has been done although they have been promised new lights will be installed. Since they are just starting a remodel of that side of the casino maybe it’s planned as part of that remodel. One more note about the craps table at Viejas: the do a “free buy” on the 4, 10 and 5, 9. No vig is charged on the initial buy although a $25 bet is still paid out at $49 so it seems to me it’s not really a free buy. Still a better deal than you’ll find most places. Minimum bet is $20 for the free buy. I think if you buy the 5, 9 for $20 then you get paid $29 instead of $28 per win. Since I usually only place bets for $5 it doesn’t impact my normal play. It is strange to see craps played with just 2 dealers! The card craps game is no longer available at Viejas. They use physical dice now, which indirectly determine the roll (1-to-1 mapping through 6 cards).